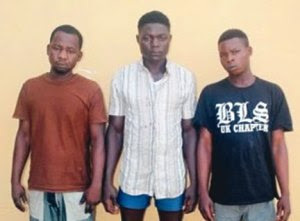 Yesterday, reported how a daredevil security man connived with his friends to murder a 25-year-old final year Civil Engineering student of the Federal Polytechnic Nekede, Imo State, Mr. Innocent Ndukwe. A security guard, who was recently arrested by the Imo State Police Command for allegedly stabbing his boss to death and stealing his belongings, said he committed the dastardly act because he wanted to celebrate Christmas lavishly. Punch reports that the guard, David Kwaguru, and two of his friends Friday Ayuba and Francis Amos, made away with the deceased’s Nissan Pathfinder with number plate, KRD109AD, two plasma TV sets, one home theatre and other valuables. Confessing to the crime, the security guard said that the rationale behind their evil act was that they needed money to celebrate Christmas next month. “Since oga Ndukwe had the money (because of his wealthy parents) and expensive household electronics, we decided to kill him, put the devices inside his vehicle and drive to Plateau State where we come from. “We waited and monitored him. And when he went into the toilet, we broke the door open, tied his hands and legs and started stabbing him all over his body. Also speaking, an accomplice, Ayuba, said that it was Amos that first struck the victim in the neck while he stabbed the student in the stomach. While parading the suspects, the CP said the police control room got a call on the incident and policemen raced to the crime scene. He said that the deceased was found in a pool of blood in a toilet at his residence when policemen arrived.